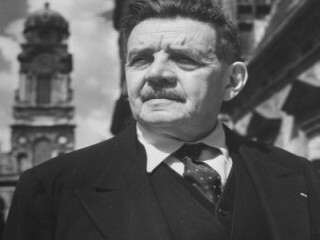 The French statesman and author Édouard Herriot (1872-1957) was prominent in interwar politics and personified the radical-liberal tradition in French political and cultural life. He was also a biographer and historian of note. The son of an army officer, Édouard Herriot was born at Troyes on July 5, 1872. After graduating with highest honors from the Ecole Normale Superieure in 1894, he rapidly acquired a reputation for outstanding scholarship and teaching. His doctoral thesis, Madame Recamier et ses amis (1904), followed by his brilliant Precis de l'histoire des lettres francaises (1905), secured that reputation. Like many young turn-of-the-century French intellectuals, Herriot was politicized by the Dreyfus Affair. As an ardent Dreyfusard, he joined the Radical party, and for more than half a century he had few peers in his passionate dedication to justice and eloquent defense of liberalism and republican democracy. Herriot began his active political career as municipal councilor of Lyons in 1904. Elected mayor the following year, Herriot held that post until his death except for a brief period under the Vichy regime during World War II. This energetic and innovative mayor imaginatively guided the city's development as a modern industrial city. In 1910 he was elected to the departmental general council and 2 years later as senator from the Rhene Department. In November 1919 Herriot resigned as senator and was elected a member of the Chamber of Deputies, where he became leader of the Radical party. After directing the opposition to the right-wing Bloc National, which had won a parliamentary majority in 1919, he organized a left-wing coalition of Radicals and Socialists called the Cartel des Gauches, which won the elections of May 1924. Herriot was then asked to form the next government. Herriot's first ministry lasted 10 months. Acting as his own foreign minister, he supervised the evacuation of the Ruhr in 1924 and recognized the Soviet Union the following year. He also unsuccessfully sponsored at the League of Nations proposals for arbitration, security, and disarmament. At home, his program of financial reforms was killed in the Senate, and he resigned in April 1925. As Raymond Poincare's minister of public instruction from 1926 to 1928, he devoted his energies to the struggle for free secondary education. Herriot served again as prime minister from June to December 1932 after his left-leaning coalition won the parliamentary elections of that year. Infuriated at his decision to pay the December installment of the French war debt to the United States, the Chamber overturned his government. Herriot served as vice-premier under Gaston Doumergue in 1934 and P. E. Flandin in 1934-1935 and was elected president of the Chamber of Deputies in 1936. He remained in that office until the fall of France in June 1940; he abstained the following month when the French Parliament voted full powers to Marshal Petain. Though he took no active role in the Resistance, his hostility to the Vichy regime was widely known. In 1944 he lived under house arrest in Lyons until he was deported to Germany. Liberated in April 1945 by Soviet armies, Herriot returned to Lyons, where he had already been elected mayor. Resuming his leadership of the depleted Radical party, he was elected to the first and second constituent assemblies. In 1947 he was returned to his old post as president of the new National Assembly of the Fourth Republic and retained it until his retirement in January 1954. In his later years Herriot was the recipient of numerous honors. In 1946 he was elected to the prestigious French Academy, and following his retirement from active politics he was made honorary life president of his beloved French Chamber of Deputies. In June 1955 the Soviet government awarded him its annual Peace Prize in recognition of his long advocacy of international cooperation. Grossly over-weight and in declining health for several years, Herriot died at Lyons on March 26, 1957, a patriarch venerated by virtually all Frenchmen. View the full website biography of Edouard Herriot.